Standard has had a lot of time to shape up with the addition of Dragon's Maze. It has been around a month and a half since the newest set joined the format, and in that time we've seen a huge variety of different decks in the winner's circle. With StarCityGames.com Standard Open events every weekend along with PTQs, WMCQs, and even a Grand Prix – not to mention constant Magic Online daily and premiere events – there's a lot to take in for someone trying to prepare for Grand Prix Miami this weekend. I've been doing my research, though, to help you out in case you don't have the time to do yours. But what I've been paying attention to isn't just the decks people are playing, but the cards they're playing – and the ones they aren't. This week, I want to look at what I consider to be the six most underplayed cards in Standard. What cards aren't getting the love they deserve in Standard, and why should you think about including them in your deck for your next Standard event? Now, I'm not trying to convince you all to give me more chances to relive that moment from the World Magic Cup, but I do feel compelled to point out that Bonfire is incredibly underplayed right now. 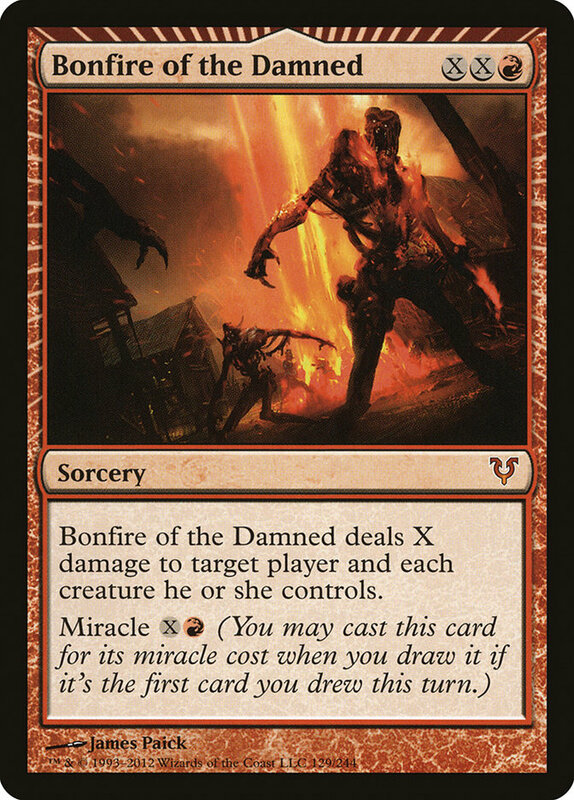 A lot of people think of Bonfire as a card you play in order to get "lucky" and play it for its miracle cost to sweep your opponent's entire board in the late turns of the game. That's certainly the best-case scenario for it, but it's important to remember that it's a totally reasonable card to play for its actual mana cost against an opponent with a lot of low-toughness creatures. Let's take a look at some popular decks in Standard right now, shall we? Each of these decks has a plethora of creatures that you can sweep off the board with a hard cast Bonfire for one or two. Junk Reanimator is extremely reliant on mana creatures for all but its most degenerate starts, while Naya Blitz and The Aristocrats have to assemble a certain critical mass of creatures in play to really put on a lot of pressure, many of which you can wipe out for the low cost of three mana. Even Bant Hexproof relies on its creatures being exactly that; a well-timed Bonfire can send Invisible Stalker and Geist of Saint Traft packing. And remember—we're just talking about the power of Bonfire when you play it from your hand. It's still the game-winning, complaint-inducing, GIF-creating monster that it has always been when you manage to miracle it. In a world of aggro and midrange decks that can end up in creature stalemates, it seems like a good time to come packing a bunch of cards that can win the game on the spot when you peel them off the top of your deck. And yet the only time I ever seem to see any of them is in Jund control decks that really aren't nearly as well set up to take advantage of the damage it deals as more aggressive decks like Naya or even more aggressive Jund builds. I think that should change. In Bonfire we trust. Rolling Temblor isn't an all-star, but it's an excellent role player. It's one of the best sideboard cards out there against creature rush decks like R/G and Naya Blitz. It's also one of the best ways around to deal with Geist of Saint Traft. I'm still very much of the opinion that Bant Hexproof is an extremely powerful deck that is underrepresented due to the "skill-less" stigma surrounding it and the fact that it's relatively uninteresting to play. For this reason, I expect that a number of pro players will show up at Grand Prix Miami this weekend with Invisible Stalker and friends. Rolling Temblor is an excellent way to hedge against Bant Hexproof while also giving you a powerful tool against fast creature strategies that many of the other anti-hexproof options like Liliana of the Veil and Barter and Blood can't do. Rolling Temblor is a particularly effective option for decks with Boros Reckoner. 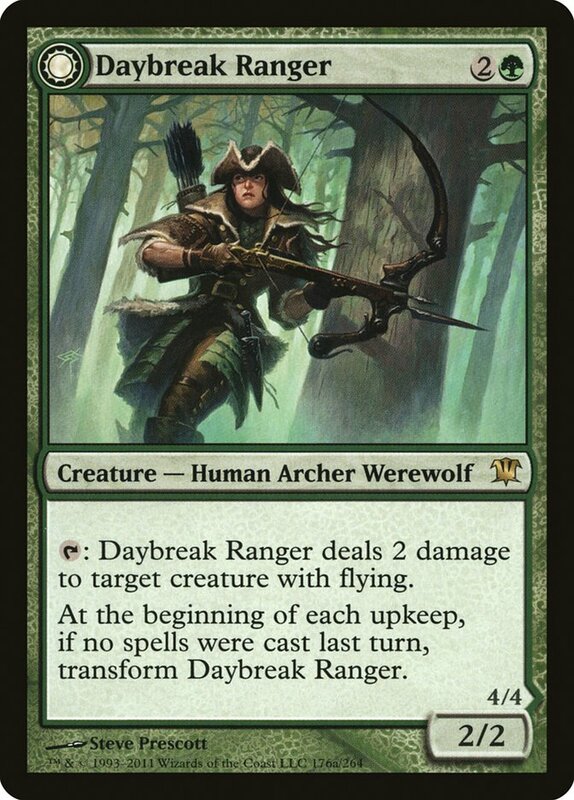 Since Temblor damages your own Reckoner, you get a chance to redirect the damage to one of your opponent's creatures to kill something bigger like a Hellrider or Frontline Medic. The fact that you can cast it a turn faster than Supreme Verdict makes it much more likely to save your life against a swarm of small creatures, and on top of all of that, it has flashback. 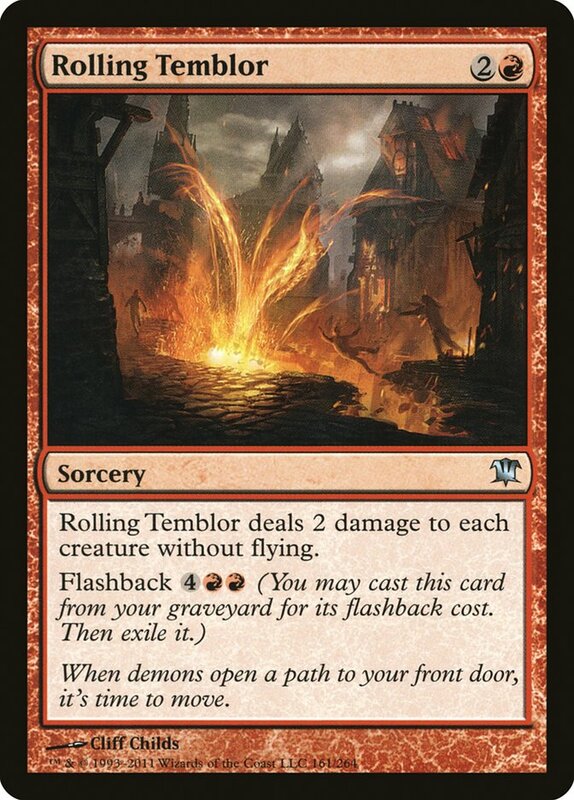 All of this added up makes Rolling Temblor a card that should get a lot more play than it does. When M13 came out, I made the claim that Farseek was likely to be the most important card in the set. The return of Ravnica shocklands was so loudly broadcast by things like the inclusion of Arbor Elf over Llanowar Elves, Liliana of the Dark Realms searching for any Swamp rather than basics, and, of course, Farseek itself that it seemed obvious to me that a card that provided such powerful mana acceleration and fixing in a single package would be one of the pillars of the format. For a while, that seemed to be the case. Jund, Bant, and various four-color green concoctions like Dark Naya were all the rage for a while, but now you pretty much only ever see Farseek in Jund control—much like with Bonfire. Now, I understand that green decks also have access to Avacyn's Pilgrim and Arbor Elf and that these cards can provide acceleration from one mana to three. But Arbor Elf in particular only does that some of the time since many of the decks playing them have between eight and ten Forests! 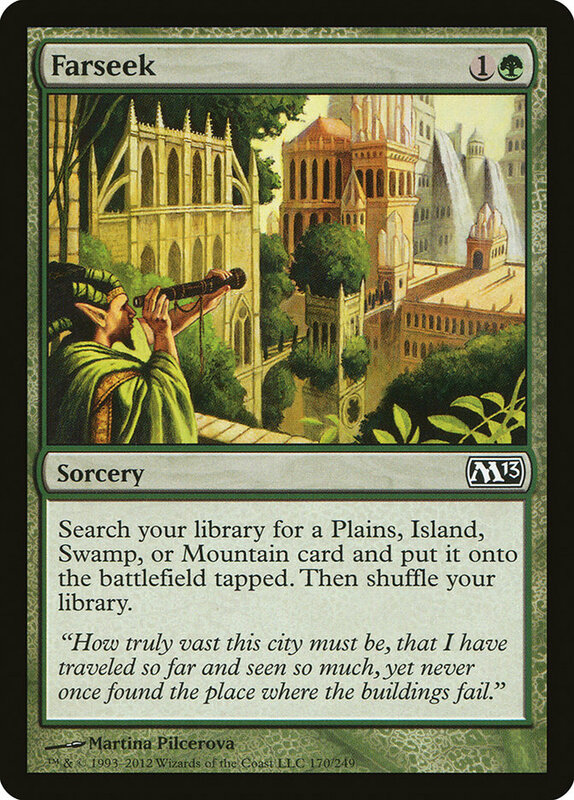 And Arbor Elf also doesn't provide the same kind of mana fixing that Farseek does since it can only give you a color of mana that you can already produce with a Forest you control. In the time that I was playing Naya in Standard lately, I had quite a few hands that couldn't generate a single mana from Arbor Elves and many others that desperately needed an extra colored mana source. With the number of four- and five-drops many of these decks are playing, why aren't they playing Farseek? Yes, it's less explosive than Arbor Elf in your best draws. Yes, it's a miss with Domri Rade. 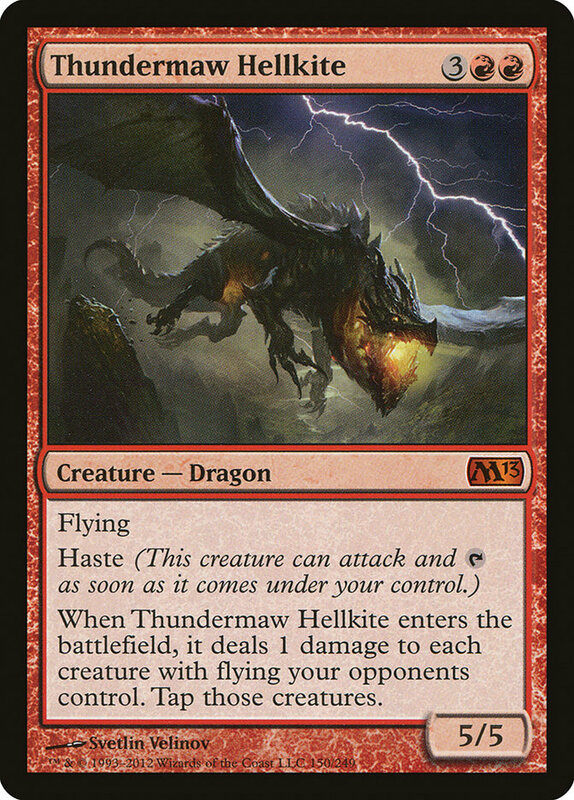 But it can get you're your much-needed second red for Thundermaw Hellkite and actually make it reasonable to play utility lands like Gavony Township and Kessig Wolf Run in your Boros Reckoner deck. I actually came very close to playing four Avacyn's Pilgrim and three Farseek in my deck at Pro Tour Gatecrash because I wasn't sure I could play enough Forests to support Arbor Elf. Ultimately, I decided I was willing to take the consistency hit for a higher ceiling on my draws, but in retrospect I think Farseek may have been the right call. Yes, Thundermaw Hellkite is played a lot right now. But it's not played as much as it ought to be. Do you realize how powerful Thundermaw Hellkite is? It showed up in multiple decks in a recent Modern Grand Prix, and one of the players who didn't have it in his deck said adding it is the one change he would make! Not only is it a 5/5 flying haste creature for five mana—which is truly embarrassing for one-time Reanimate target Rorix Bladewing—but it also clears a path for itself and all of its buddies through the air. With the popularity of various builds of Aristocrats, the Lingering Souls killing "flavor text" on Thundermaw Hellkite has almost never been better. The real issue is that people massively undervalue cards that actually kill their opponents. Look at how people build their Jund decks these days. Virtually every version out there is extremely removal heavy and incredibly threat light. Can you win with nothing but Huntmaster of the Fells, Olivia Voldarens, and Thragtusks? Obviously. Are you better off having some number of threats that can actually close out games quickly in a lot of matchups? Absolutely. In the wake of the recent legend rule change announcement, I heard all kinds of complaints about how clones no longer functioning as Hero's Demise makes many hexproof legends too powerful. "How can I ever beat Geist/Sigarda/Thrun?" The answer is to kill your opponent. If your opponent has a Sigarda and your deck is nothing but removal, you're probably dead. But if you have a Dragon of your own, it's entirely possible for you to be the one attacking them to death. A wise man once said, "The best defense is a good offense." That applies in Magic just as well as in war. And you know what makes for a good offense? A Dragon, that's what. The answer is that they're commonly played, troublesome permanents that you really, really want to get off the board quickly. In the case of Domri, Reckoner, and Courage, they're generally pretty difficult to remove with the spells a lot of decks have at their disposal. Not too many decks play Dreadbore to directly kill planeswalkers, and a lot of the removal out there can't get rid of Mr. Minotaur Wizard without him bringing down a Reckoning on you or one of your creatures. Unflinching Courage? Well, it's usually enchanting Invisible Stalker or Geist of Saint Traft, making it very difficult to get rid of let alone beat if it stays in play. 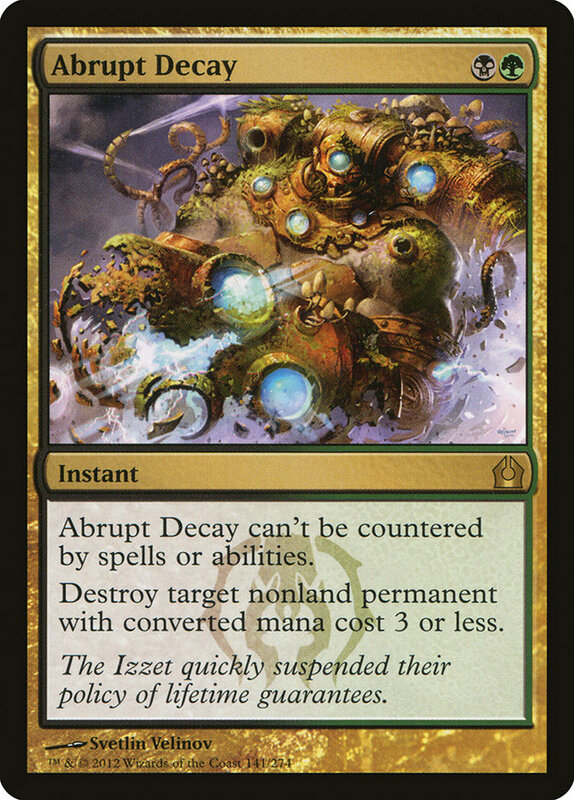 Abrupt Decay is one spell that deals with all of these cards for the low, low price of just GB. It also happens to be able to take out a number of other commonly played cards like Loxodon Smiter, Firefist Striker, Flinthoof Boar, Mayor of Avabruck, Oblivion Ring, Fiend Hunter, and more. Standard right now is very fast and is largely defined by cards that cost three or less mana. Abrupt Decay offers a flexible and efficient way to deal with almost all of them. Sure, it's not the best at handling cards like Voice of Resurgence and Strangleroot Geist, but that's what your own creatures are for—you are playing creatures, right? Why else are you reading my article? There's a very good chance my deck in Miami will include a few of these cards. I haven't quite figured out all of the details, but I'm the kind of guy who's been known to attack with a Dragon or two and this weekend I'm taking my talents to South Beach. Hope to see you there!